Domain Authority (DA) is a website scoring system developed by to predict how well websites will rank on search engine result pages (SERPs). A website can have a Domain Authority score anywhere between one and 100. The higher the score, the higher the domain authority and the greater a page’s ability to rank high in search results. The calculation for determining a site’s Domain Authority score evaluates multiple factors. These include the linking root domains and the number of total links. You can use this score to track your own website’s ranking ability over time. Or you can use it to check out the ranking strength of your competitors’ sites. There are dozens of online tools that will allow you to check a site’s Domain Authority, including Moz’s own MozBar which is powered by their link index Linkscape. You can also use Moz’s Link Explorer to check the Domain Authority of any website. Google’s PageRank score used to allow people to see how authoritative pages were, based on how many and how high quality of links they had. In 2016, Google stopped publishing PageRank scores publicly (often called Toolbar PageRank) so Moz’s Domain Authority score is a useful directional replacement tool. Domain Authority is a quick and convenient way of providing you with an overview of a website’s ranking potential, based on its portfolio of links. This overview also gives you a simple, at-a-glance image of how likely a domain is to rank well in the search results pages (SERPs). Links are not the only factor in how well a page ranks of course, but a strong correlation exists between a site’s domain authority and how well its pages rank. Domain Authority can also be used to quickly evaluate if a website has enough authority to be worth targeting for link building. For example, a backlink earned from a site with high Domain Authority would be more valuable than from a site with low authority. Since it can be difficult to calculate the Page Authority of new pages, Domain Authority works better as an overall measure when evaluating link value. 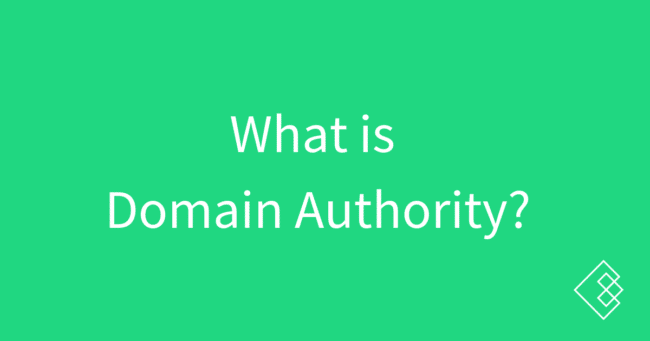 The most significant point to clarify when it comes to Domain Authority is that it only measures the authority of a root domain. This means that it cannot distinguish subdomains, and does not measure the authority of individual pages within a domain (that would be Page Authority). In most cases, the inability to separate subdomains may not be an issue. However, consider a site such as WordPress. In this case, Domain Authority won’t be able to separate the value of WordPress’ domain from all the free WordPress subdomains that operate as individuals’ personal sites. Also, although Domain Authority is a relatively reliable predictor of SERP placement, it’s not perfect. There will be cases where a page belonging to a domain with high Domain Authority will not rank highly. And cases where a page belonging to a domain with low Domain Authority will rank very well. Domain Authority is not an absolute metric, but rather a contextual metric against the other sites within Moz’s index. Domain Authority meant to tell you how likely a site is to rank better than other sites, and since Domain Authority works on a logarithmic scale it is harder to raise your Domain Authority from a 50 to a 55 than from 20 to 25. In other words, it’s intended to be an overview of a site’s competitiveness. Which means its score is affected not only by your site but also by the quality of your competition. So, it’s not something you can necessarily influence directly. The critical consideration is not what your Domain Authority is out of 100, but how it compares to the Domain Authority of your competition. If you have a Domain Authority of 39, you may assume that’s bad. However, if your primary competition all have scores ranging from 20–35, then you’re doing very well. Finally, Domain Authority is a directional metric which means that it is an indicator of how well a site might rank. It is not a metric that a business owner, CEO, or SEO should measure as an indicator of success as it is a number that moves over time with the rest of the web. This means that your DA could go down when in reality you have been cleaning up your website technically, creating content, and building links and thus your traffic and revenue are going up. Your DA going down means that other sites have become stronger faster than yours, but this also does not mean that your direct competitors have done that as well.